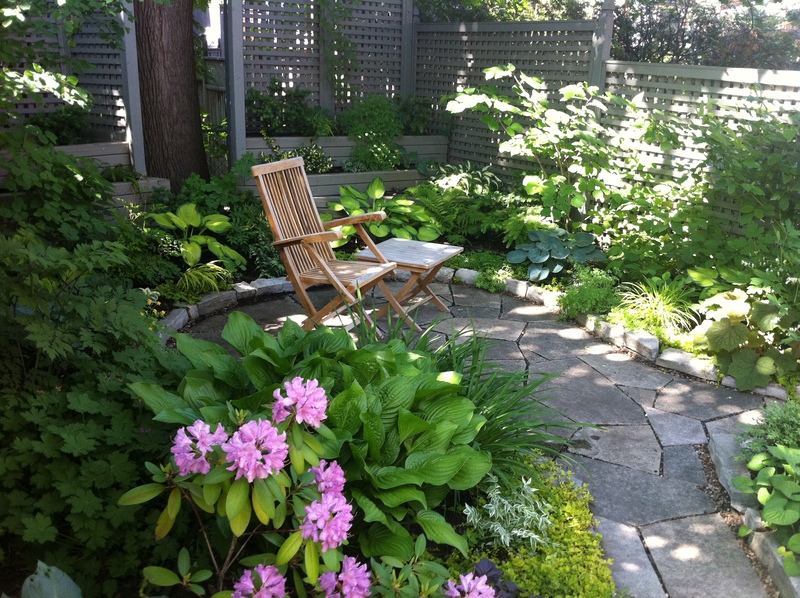 This is a garden that belongs to a friend and client, and that I secretly covet because it is so peaceful and private. It has been a work in progress over the last several years, not least of which due to the challenges of planting under a very large, very thirsty Norway maple (you can see its trunk sandwiched between the lattice panels). This is the first year the rhododendron has bloomed significantly, but clearly it needs some attention as its leaves appear chlorotic – not the yellow we were going for! These lattice panels and fencing allow for privacy without the feeling of being closed in. They also provide some textural interest along a flat plane that divides the properties. 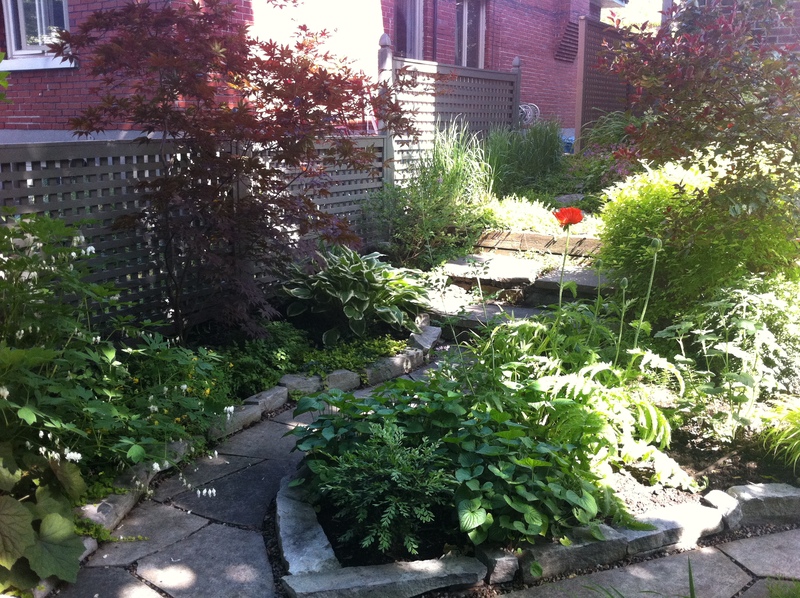 Two stepped planters along the rear next to the maple’s trunk provide added planting space that is (theoretically) not taken up by maple roots and allows for more vertical interest in a confined space. The challenge here has also been to provide intermediate height: somewhere between the overwhelming maple canopy and the scale of the perennials. We have achieved this with several small trees and shrubs: a serviceberry, a dogwood, a witchhazel, a ‘Bloodgood’ Japanese maple and a transplanted purple-leafed sandcherry. We have also used a lot of yellow to brighten up this secret garden. Previous PostThis treasure does not last long enough…Next PostI am a boy who likes basketball; did I say that already? This is my dream garden, thanks Ailsa. So soothing! Thanks Kathi! Yes, it is a very soothing space – but as you can see, also very tiny. A perfect jewel. You’re dead-on re: hostas! I had an old Victorian up north with one of those big wrap-around-the-turret front porches….omg!! we had it totally lined with the empress wu variety and by end of summer people would stop when driving by just to gape at their size and beauty. That house was a work-of-art in every way….but it drained my money,time and emotional resources!!! Can’t say I miss it, but the hostas? Those, I miss!!! 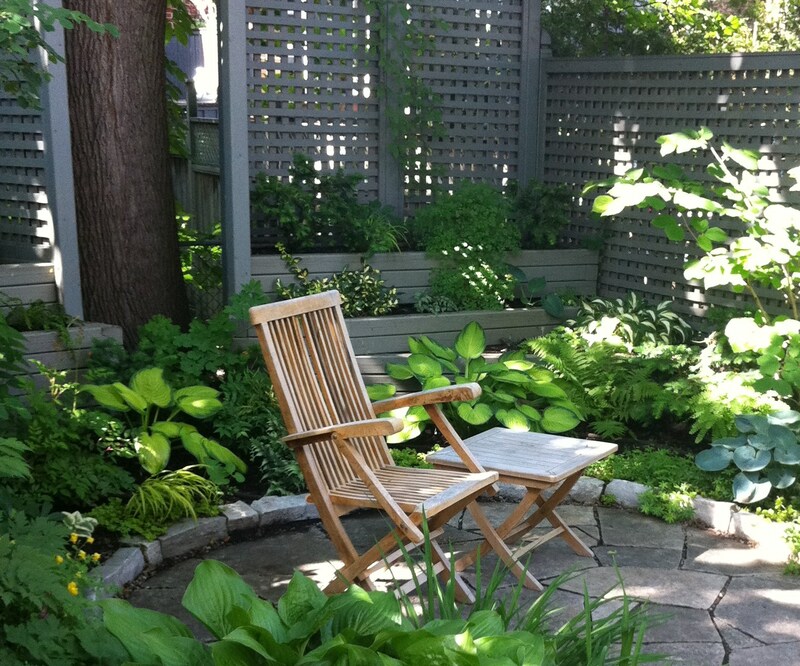 I had to google ‘Empress Wu’ hosta because I wanted to get an exact vision of your planting – I was right! I knew it was big, but didn’t remember it was blue too. What a show-stopper; I hope you took pics before moving. You’re right about those old Victorian homes – they are beautiful but also costly, in every way :c( I guess Florida is not the best place for hostas; but hey, you can grow so many other show-stoppers!